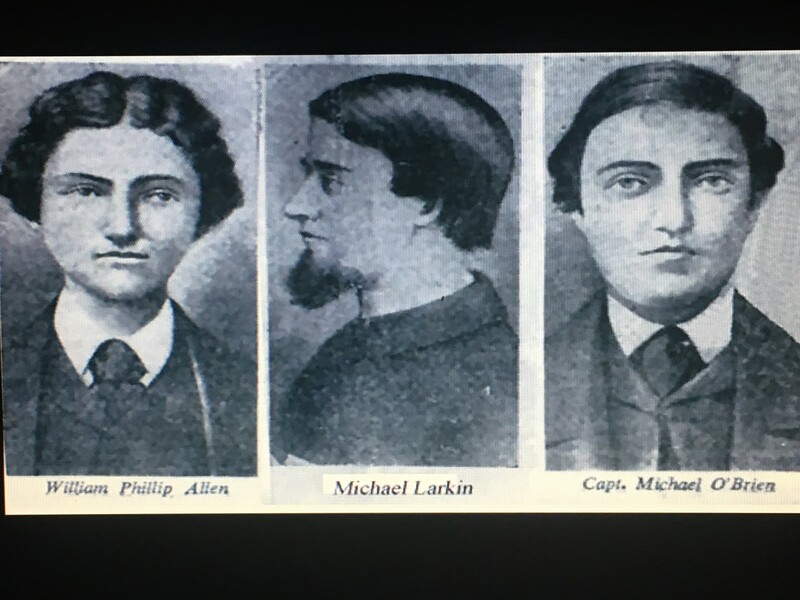 This week marks the 150th anniversary of the Manchester Martyrs – they were William Allen, Michael Larkin and Michael O’Brien, all born in Ireland but living in Manchester and active Fenians. In 1867, after a most unconvincing trial, they were executed for their part in a successful ambush to free two Fenian leaders from a prison van in which a policeman Sergeant Brett was shot dead. One hundred years ago, on Sunday 26 November 1917 the fiftieth anniversary of the Manchester Martyrs was celebrated in Cork by Sinn Fein and the re-organised Volunteer battalions. a public procession through the principal sheets of the city and a meeting at the National Monument, Grand Parade. The procession was an impressive one, and the route was through North Main Street, North Gate Bridge, Pope’s quay, Bridge Street, King Street, Brian Boru Street and bridge, Merchant’s Quay, St Patrick street, and Grand Parade. The Volunteer Cycle Corps was in the front, then came the, Pipers’ Band, followed by the Irish Volunteers, the Cork Workingmen’s Brass and Reed Prize Band. When the different contingents reached the National Monument, orations were delivered, which compared the IRB / Fenian movement with the ongoing Independence campaign in the post 1916 era. The Irish Republican Brotherhood (IRB) was founded in Dublin and New York in 1858. The founders included James Stephens, John O’Mahony, Charles Kickham, John O’Leary, Thomas Clarke and Michael Doheny, all of whom had been connected in a post-famine rising in 1848. In addition, Jeremiah O’Donovan Rossa established his Phoenix Society at Skibbereen, County Cork. The belief of the IRB or later to become known as the Fenians was similar to that of the ideas of Thomas Davis on Irish nationality, and they also believed that Britain would never concede independence without the use of physical force. Their central focus was to concentrate on the independence of Ireland from Britain. The followers of this organisation were primarily working men, in particular small farmers. By 1867, thousands of such persons had enrolled and preparing themselves for action. 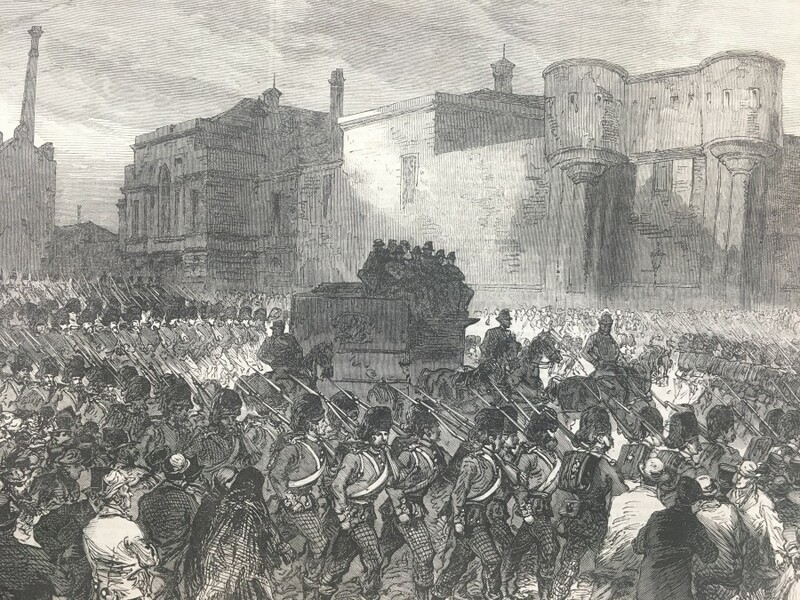 On 5 March 1867, risings took place in Dublin, Cork and Limerick, On the night of Shrove Tuesday, 5 March 1867, over 2,000 Fenians in Cork City were ready for action. The rallying point was at Limerick Junction and the Cork Fenians were to meet with forces from Kerry and from Mallow and surrounding areas in North Cork. With not that many weapons between the groups as a whole, it was planned to raid private houses and barracks for guns and ammunition and hope that munition shiploads would arrive from the USA in Cork. However, the plan was not to be that straight forward. Cork weather in the form of a blizzard and high resistance among munition stations hampered the quickness of an attack. Thus, instead of advancing, the Fenians were forced to retreat with the eventual order being given to disperse. On 11 September 1867, Colonel Thomas J Kelly (Deputy Central Organizer of the Irish Republic) was arrested in Manchester, where he had gone from Dublin to attend a council of the English ‘centres’ (organisers), together with a companion, Captain Timothy Deasy. A plot to rescue these prisoners was hatched by Edward O’Meagher Condon with other Manchester Fenians. On 18 September, while Kelly and Deasy were being conveyed through the city from the courthouse, the prison van was attacked by Fenians armed with revolvers, and in the scuffle Police Sergeant Charles Brett, who was seated inside the van, was shot dead. The three Fenians, who were later executed, were remembered as the Manchester Martyrs. On the same day as the executions in November 1867, Richard O’Sullivan Burke, who had been employed by the Fenians to purchase arms in Birmingham, was arrested and imprisoned in Clerkenwell Prison in London. In December, whilst he was awaiting trial a wall of the prison was blown down by gunpowder in order to affect his escape. The explosion caused the death of twelve people, and injured one hundred and twenty others. A week later the Foaty Bay Martello Tower in Cork Harbour was attacked by Fenian members on St Stephen’s Night, 1867. William Lomassaney O’Connell from Passage West with an alias of Captain Mackey led the attack. The tower garrison consisted of two gunners of the Royal Artillery. He and other members took a number of eight-pound cartridges, variously stated from ten to twenty, besides a quantity of fuse. After staying for some time, they left the tower, to which it is supposed they had come to in boats. William Lomassaney was a wanted man by the police for the raid on the Martello Tower. He was arrested with two of his accomplices at Cronin’s public house in Cornmarket Street, Cork on 7 February 1868.